Compare prices from several car hire companies in Alicante Airport and find the best price for car rental. Our prices always include unlimited mileage and insurance. 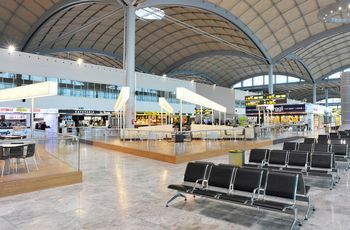 Many arrive at Alicante Airport (ALC) to travel to either the city of Alicante, located approx. 10 km north of, or any of the other popular resorts on Spain’s Costa Blanca. There is no train to the airport, but from Alicante you can take a bus or drive along the motorway Alicante-Murcia, or N-332.At the airport there are many car rental companies and taxis. The international airport Alicante Airport is the 6th busiest in the country, and in 2009 it was noted that over 9 million passengers used the airport. Hola Airlines, Iberia and Ryanair are some of the airlines, and it offers flights to cities such as Tenerife, Reykjavik, Pisa and Moscow. Facilities at the airport include three duty free shops, souvenir shops, kiosks, cafés and four restaurants.